All aboard! 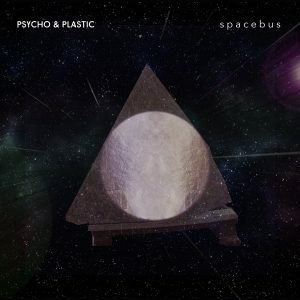 Psycho & Plastic at the controls are about to pilot their “Spacebus (featuring Hezza Fezza)” to worlds no human has ever laid eyes upon. The thrust of a thumping beat lifts the track off of its launch pad, the bass line is oozing acid and we’re all-in, gyrating skywards. “Let’s go to space!” demands collaborator and American exchange-astronaut Hezza Fezza, her voice reeling in and out of the ruckus produced by the rumbling rocket engines that relentlessly keep pushing upwards and onwards. Never before have Psycho & Plastic embraced the dance floor so unconditionally and persistently. In keeping with the fine traditions of raving rocket men and musical mystics, they zoom directly into zero gravity turned sound and psychedelic noise clusters. They fully integrate Hezza Fezza’s vocals into their galactic instrumentarium, steer through synth-nebulae and percussive particle storms. With an afterburner and plenty of pizazz, the 2+1 crew of the Spacebus rides bass waves through the infinite vastness of space. The B-side “Zvezdolet Lokomov” wafts and sways from the on-board sound laboratory as the dauntless explorers’ gauges are recording the birth of a new galaxy. It is fuelled by a deep love for sonic experimentation, ambient textures, and radio plays. The track hails from recording sessions in Chemnitz (nè Karl-Marx-Stadt), where Psycho & Plastic cut their first full length album. The latter is due to cross Earth’s orbit in 2017. Until then, this release testifies to Psycho & Plastic’s spirit of cosmic exploration being poised on the threshold of a new world.